I got to take a look at the data, focusing on Night Bus routes. 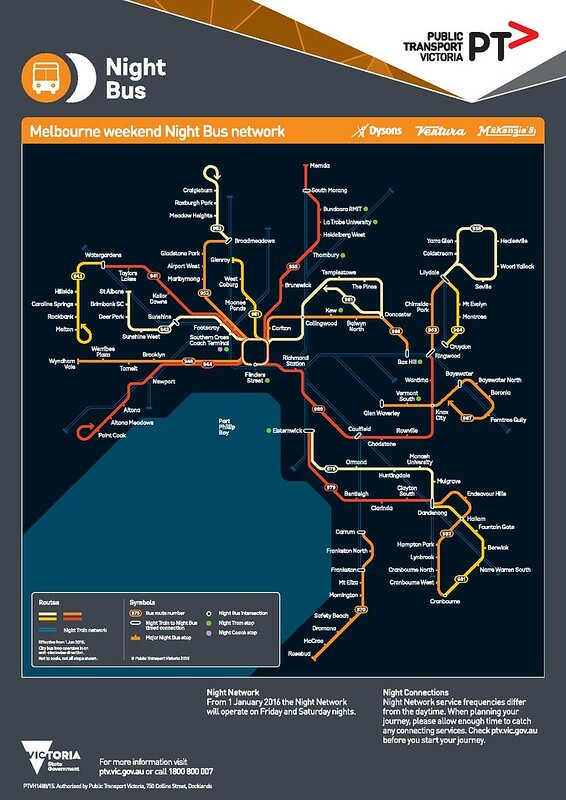 The current Night Network commenced in January 2016, following a 2014 election pledge by Labor to introduce all-night trains (on all suburban electrified lines) and trams (on 6 routes), as well as coaches to regional destinations. Night Network started as a trial, but was made permanent in 2017. Night Bus routes were designed to complement the Night Train and Tram routes. Data has been scarce, but anecdotally the trains and trams have had reasonable patronage. 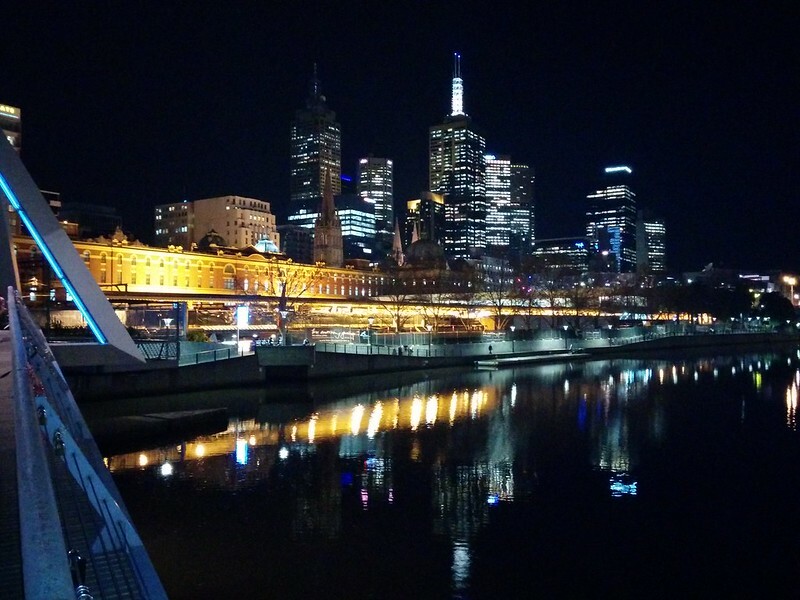 In 2016 it was reported that there were 35,000 people using the Night Network each weekend. This newly available patronage data reveals details of how the Night Buses specifically have been performing. Here’s how it looks – the source data included patronage for the entire year, and an estimated average per weekend night. I’ve compared the latter to the number of services, which gives us the average number of passengers per service. The most-used routes are those running every 30 minutes (rather than hourly) except for the 941/942 which each run every 60 minutes but provide a combined 30ish minute service between the City and Braybrook. But even the most used routes are only averaging 2-3 boardings per service. That’s really not very good. Passenger numbers are probably higher for outbound services, lower for inbound services. But even 6 people per service isn’t outstanding for what are mostly quite long routes. Hourly suburban Night Bus perform very poorly. Those routes are timed to meet hourly trains, so upgrading them to half-hourly may not help unless the trains switch too (which would be good). For comparison I’ve included figures for regular daytime route 701, one of my locals. It only runs every 30 minutes on weekdays, 60 on weekends/evenings, but it gets 7 times the number of boardings per service of the best performing Night Bus route. And on a typical weekend that one route gets 369 passengers; more than 60% of the number of passengers on the entire Night Bus network. The worst performing Night Bus routes are only getting a passenger on one in every ten services. 90% of trips don’t pick up anybody. That’s an absolutely appalling waste of money. The total number of Night Bus boardings per weekend in 2017 was 1,133. In comparison, for all public transport boardings, buses usually account for about 21% of trips around Melbourne. It’s not hard to conclude that the Night Bus network urgently needs a shakeup. As noted in a previous post, a big part of the problem is that the route structure, unlike the trams and trains, is completely different to the daytime routes. This means that the routes are unfamiliar to passengers. It also means in some cases people can’t get a bus before midnight, but can after midnight. This makes no sense. They would do better to scrap the Night Bus routes and start again, by using those resources to convert the busiest daytime routes into 24-hour routes. This could include both buses and trams – since Night Tram only covers 6 of the 24 routes that run during daytime. Even running as nighttime variations of existing daytime routes would be better than the current situation. For instance, route 966 is similar to daytime route 207 (one of the busiest bus routes), but diverts along Tram 48 (which does not have Night Tram service) for some of the distance, and terminates at Box Hill at the outer end. So call it 207, or even 207a or N207 so that people know it’s basically the same route. And if service coverage is absolutely needed to areas which are barely getting any passengers, maybe other cheaper options can be examined, such as on-demand buses or carefully targeted taxi/Uber subsidies. With so much pressure elsewhere on the public transport network, including on buses, resources have to be carefully allocated. There’s no point running buses that nobody uses. It was broken up by weekday/Saturday/Sunday. In the Night Bus context, this appears to mean before 3am Saturday; Saturday 3am to Sunday 3am; and Sunday after 3am – this is complicated, which is why I’ve used total numbers for the whole weekend. A few numbers appeared in the 2016 data for old Nightrider routes. This might be because it was by financial year. I’ve concentrated on the 2017 data, which only shows the Night Bus routes. It is, of course, possible that some quiet routes have seen patronage growth since 2017. But I wouldn’t bet on it. Some services only run part of the route. This is one reason I avoided trying to measure boardings per service kilometre, which is sometimes used to evaluate bus service performance. Suburban hourly Night Buses are timed to meet outbound trains. But some Night Bus stops are located too far from “connecting” stations to provide a seamless connection. What happens when Night Trains are replaced by buses for planned works? Well here’s an example: outbound Craigieburn Night Trains normally reach Broadmeadows at 55 past the hour, and the 953 bus departs five minutes later. But this weekend it’s bus replacements – arriving at 12 past the hour. The “connecting” 953 schedule hasn’t been changed. And planned works are not a rare thing at the moment. Thanks to the Victorian Greens for FOIing this data, and to The Age’s Timna Jacks for passing this it on. …uses the station five days a week and said she had given up trying to get a park at the station. Aircraft is not unique in this regard. No suburban railway station has enough car parking to meet demand. It’s basically impossible to achieve. It’s extraordinarily expensive, and doesn’t scale up. If someone walks or cycles to the station instead of driving, is that actually a bad outcome? “The footpath’s broken, it’s very narrow, the railings either side of the footpath are inadequate and inappropriate. “I lock my bike to the fence … there’s just no bike security. All of these could be fixed without just giving up and expanding the car park at huge cost, so it fills up a few minutes later each morning, and generates more car traffic into the precinct. Unfortunately, it looks like the nearby level crossing removal won’t provide upgrades to the station either way. Bike cages? Or something else? 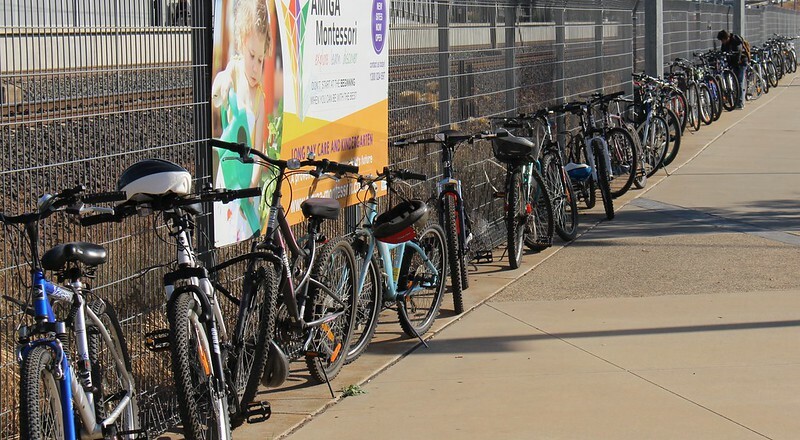 In Europe and Asia, you see huge numbers of bicycles parked at railway stations. Could we get the same outcome here? I’m not sure a cage is necessarily much more secure than locking a bike to a fence. Almost anybody can get a bike cage card key. 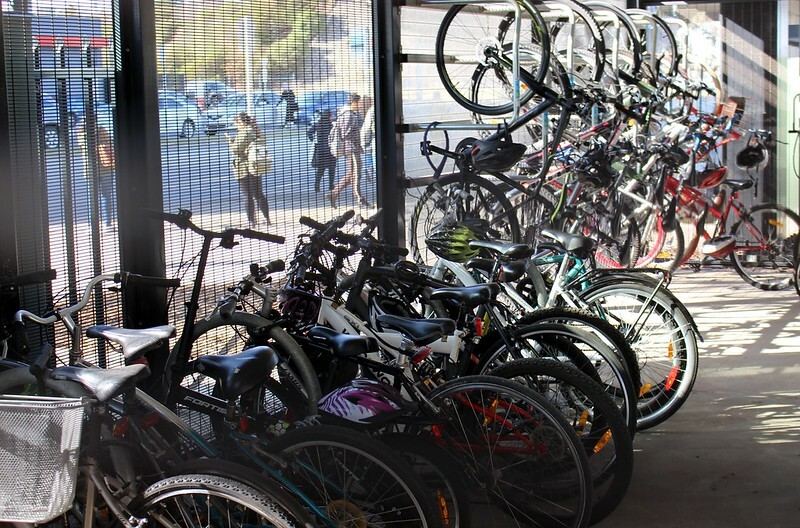 And bike cages are pretty expensive to install en masse – around $100,000 for a standard cage (fitting 26 bikes). That’s a lot cheaper than car parking, but still quite pricey. I’ve been reliably informed that bike theft can be a problem, but it almost never happens if a D-lock is used – because D-locks can’t be cut through with bolt cutters. The Aircraft commuter’s situation is not unique. Many people would like to drive to the station. They’ll never be able to do so, because providing a car spot for all of them is completely impractical. 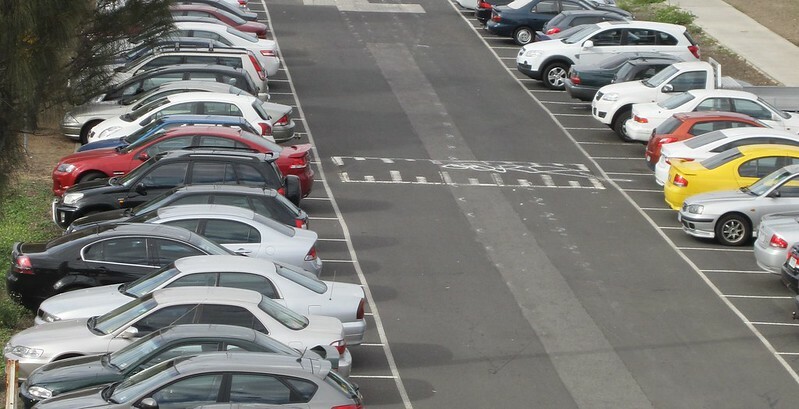 Station car parks are often very prominent, usually taking up more space than the station itself, but that’s because cars take up so much space. The statistics show that most people don’t drive to the station. Not even in Zone 2. Most people walk, cycle, or catch a bus or tram to the station because it’s the best (or least worst) option for them. Given costs of providing station parking make it impractical on a large scale, it’s good that most people can find another way. But the article is right – bicycle parking could be a lot better than it is. The next station out from Aircraft is Williams Landing, which has 666 car park spaces  – also full early each morning. It turns out that a lot of people are cycling to Williams Landing. 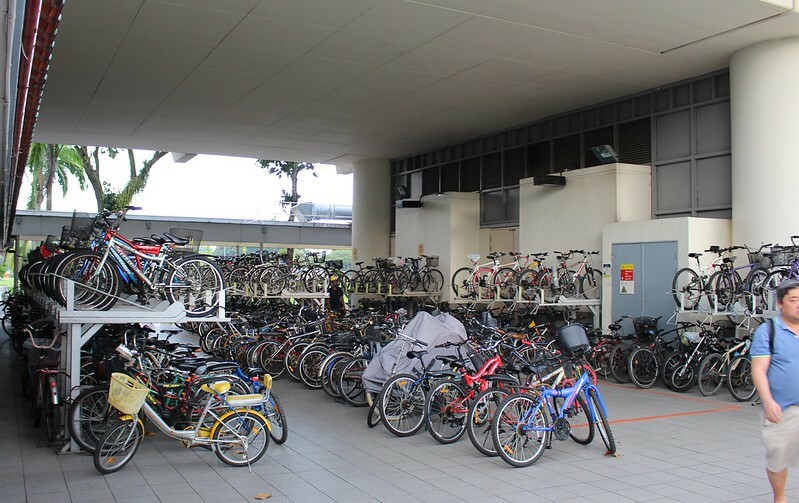 When I took a look one weekday afternoon, I found the bike cage was packed full of bikes. …and nearby, this fence had a long row of bikes along it. This is good. The more people cycling, the better. So what’s the best way to encourage even more people to cycle? Better bike lanes and paths will help, but if every fence already has a bike chained to it, what about more station bike parking, on a large scale? If more Parkiteer bike cages are expensive, are there cheaper options? Turns out the Department of Transport and Monash University have been working on something: The Wheelie. A bike parking device (BPD) co-developed by Transport for Victoria and the Mobility Design Lab @MonashUni. It’s a simple metal structure that is compact – designed to fit into an area the size of a parking space – and can cater for up to nine bikes. It looks quite ingenious, and could help cater for a lot more bike parking around stations as well as places like university campuses. I’m told the cost is under $1000 to manufacture it, plus some installation costs – kept low by not needing excavation (which in turn can impact underground services) – it’s just anchored to a block of concrete. Unsophisticated, but effective. And the design is Creative Commons, so anybody can make and deploy them. The key is to target installation sites carefully: probably better at staffed stations, in view of CCTV, in a well-lit spot, and preferably undercover. Cycling’s not for everyone. (I don’t currently have a bike.) And connecting buses should be better. But if this new design provides a cheap affordable way to get more people to railway stations without them having to drive and add to local congestion, then that’s a win for everybody – even those who do have to drive. The new PTV web site just says the station has parking, with no detail. Only the old web site specifies the number of spots. I could moan on about Friday night’s experience with the replacement buses (a combination of poor night-time service provision and inaccurate passenger information) but you can read about that on Twitter, so instead let’s look at Monday night’s south eastern train problems. It often takes multiple factors to result in a real mess. So it was on Monday. 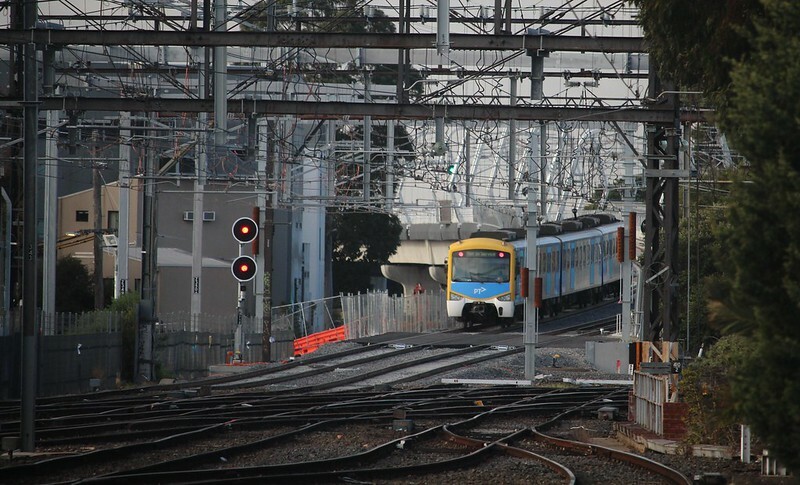 And… an infrastructure issue at Elsternwick meant it was difficult to terminate trains halfway along the line – so the entire Sandringham line had to be closed. This last one was the icing on the cake, resulting in huge queues on Princes Bridge and around Federation Square for buses. In the past, they would have been able to run trains from the City out as far as at least Elsternwick. If this had been possible, it would have had numerous benefits. Could they have run trains as far as Brighton Beach? It’s not clear. Some AM peak trains originate there, but sources say trains can only terminate on platform 1, which is not normally used, and is fenced off. This in turn would require the train to be emptied at Middle Brighton, where there are no staff – and this is not a great location to change large numbers of people onto bus replacements. So what was the problem at Elsternwick? 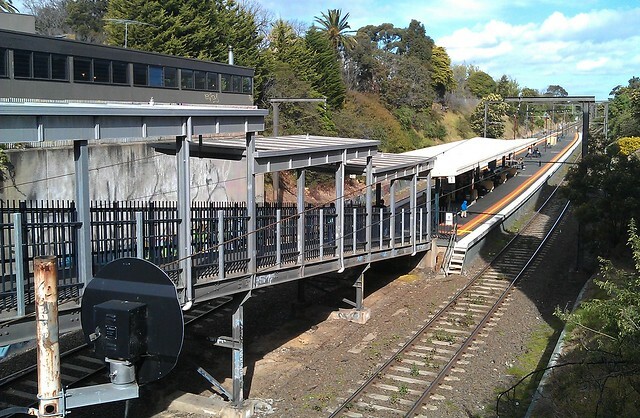 Until recently, terminating trains at Elsternwick for planned works or unplanned incidents was a common occurrence. But back in January, Metro flagged to their people that it was no longer possible, except in specific circumstances, and required extra measures to be taken. Also this weekend: the entire Sandringham line is closed. Interviewed on Tuesday by ABC’s Jon Faine, PTV boss Jeroen Weimar gave an indication of the complications. We have a turning point at Elsternwick, but it’s a manual turning point, it requires people to go out under safeworking orders. It’s something that you can’t activate on the spur of the moment. … It’s an old-fashioned manual set of points. That introduces a number of risks for people working in that environment. … It requires people to be working on a live railway, and when you do that without going through a safe and effective planned process, mistakes get made, and things get a lot worse. So is it really more difficult to get the right staff on-site at Elsternwick to go through the process, or to conjure up hundreds of buses to move thousands of train passengers, knowing they’ll never cope with demand? I doubt this upgrade is directly in response to Monday, but rather with the knowledge that during May and June, they’re going to close the Sandringham line for more metro tunnel works. The upgrade is good news. It makes sense to make Elsternwick capable again of terminating trains. Obviously the less of the line gets closed, the less impact and the easier it is to manage. What of the broader network? In recent years, Metro have been removing points around the network, on the basis that less complicated track layouts result in fewer locations where trains need to slow down, and also mean fewer infrastructure faults. Unfortunately, accidents will happen. An accident near one end of the line shouldn’t close the entire line – especially at the City end. Ultimately, when incidents or planned closures take place, the infrastructure and the broader network needs to be able to cope. The Principal Public Transport Network (PPTN) reflects the routes where high-quality public transport services are or will be provided. It supports integrated transport and land use planning by encouraging more diverse and dense development near high-quality public transport to help support public transport usage. 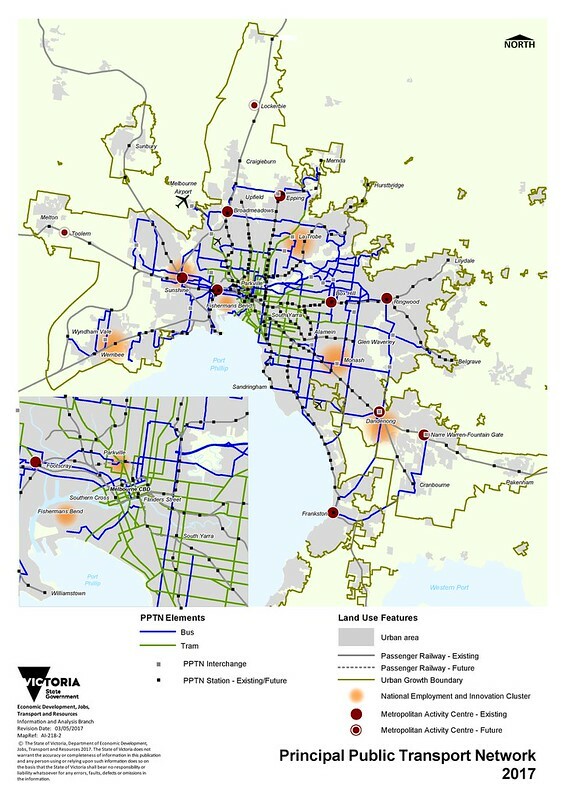 In other words, it’s Melbourne’s attempt to tie good public transport into planning and land use. For instance, recent changes to the state planning provisions include relaxed requirements for parking near the PPTN (section 52.06-5), and discourage major facilities from being too far from the PPTN (section 17.02-2S). Extended tram lines and the establishment of a light rail system. It all sounds very positive. The theory of concentrating major development around good public transport, improving services, and allowing reduced parking can lead to good outcomes. In effect it’s trying encourage development that will lead to people using public transport over cars, at least some of the time. The only difference is that for developments not near the PPTN, there’s an additional requirement of one visitor car park per 5 dwellings in the development. All this is a minimum. Property developers are able to build more car parks if they think their customers will buy them. The problem is that car parks are expensive, especially the underground car parks normally associated with medium density developments of the type popping up around railway stations. Cost of parking adds to the cost of housing. And lots of car spaces encourages car ownership, and inevitably, car usage. There are cities in the USA where they are completely removing the parking requirement for some homes around mass transit. 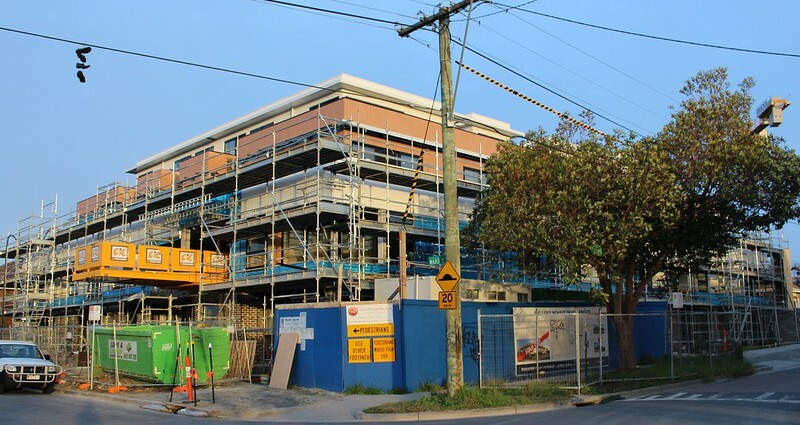 There’s no provision for this yet here, but the City of Moreland is seeking to override the rules, by allowing developments with no off-street parking in certain locations close to good public transport. It’s not a requirement for no parking. Again, it’s up to the developers to figure out what the market wants. These areas already have low rates of car ownership – so why not improve housing affordability for people who don’t want to own a car, or want to own fewer cars? As long as local streets have parking restrictions that prevent people parking lots of cars there instead, it can work. The PPTN isn’t dense enough. It’s basically the existing train and tram networks, and some bus routes. If you assume that only the PPTN routes will be the ones that are really competitive with car travel, by providing long hours and fast, frequent service, there are some vast gaps. Okay, so it’s just the principal network. Not every route can be part of it. But for instance, the PPTN includes no routes at all south of Frankston – not even to Mornington. That just seems illogical. The PPTN’s implementation is patchy. In fact, some of it doesn’t exist at all. The PPTN mapping tool shows, for instance, a bus route along East Boundary Road, between Centre and North Roads. Good idea, except than no such bus route exists. One will be introduced in June, but it’s unclear how frequently it will run. 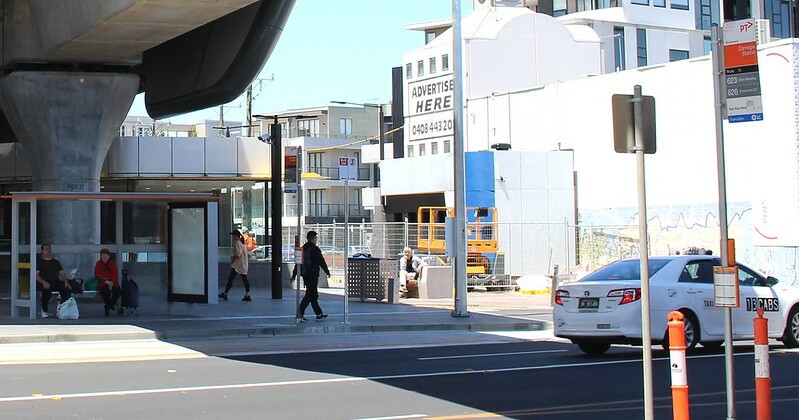 #Bentleigh locals wondering what happened to the new bus route🚌 from Moorabbin to Chadstone: it's in the latest @NStaikos newsletter – starting 16th June. Even where the PPTN does exist, service quality varies widely, and it’s improving only very slowly. It’s quite reasonable to assume that people living close to a railway station will (at least on the better served lines) be able to often use that service instead of driving. At the very least, they might be able to own fewer cars in their household than they would elsewhere. The same might even be the case along some tram and frequent Smartbus or other high quality bus routes. But it’s highly unlikely along the many less frequent routes on the PPTN. Buses can be improved, and relatively cheaply compared to major infrastructure projects. The bureaucracy has, or at least had, a plan to make them better. But it’s never been fully published, and there’s no hint of funding to make it happen. This is not helped by literally billions of dollars instead being built on new motorways – the West Gate Tunnel (which includes substantial government funding, despite it being privately built) and the North East Link – which will only serve to help grow car traffic. The PPTN, and the associated planning provision, have great potential to help coordinate public transport and urban development. But a lot more effort needs to be put into planning a more extensive PPTN, and of course actually implementing it. I’ve mentioned this in passing before, but what the heck. 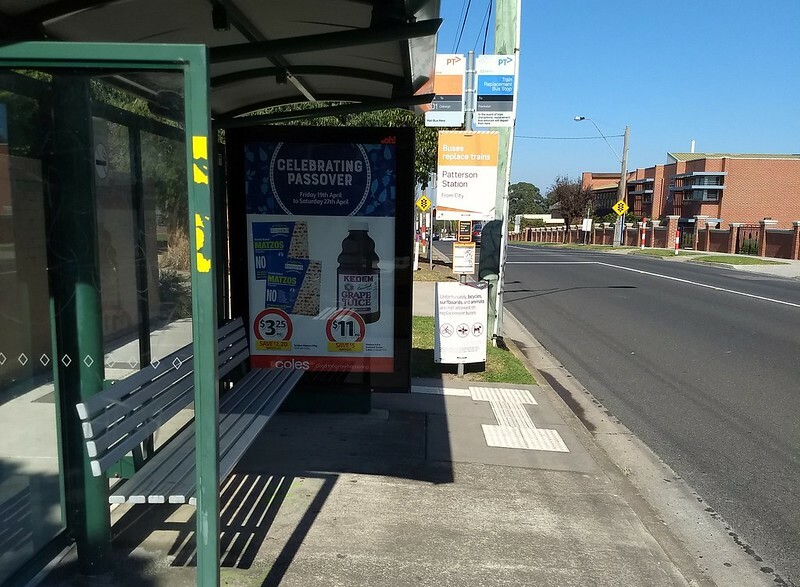 This is a bus stop on Jasper Road in Bentleigh, opposite Our Lady of the Sacred Heart College. Normally it’s used by local bus route 701. It’s also used when there are planned rail replacement buses running, as the designated stop for Patterson station. These ran this weekend just gone, and will run again over the coming Easter long weekend. Back in 2006, under a government plan called Meeting Our Transport Challenges, route 701 was one of the first to get extended hours, with services until about 9:30pm, and the introduction of a Sunday service – only hourly, but better than nothing. When the rail replacement buses run, they are scheduled until about 1am outbound, with services all night on weekends. These hours apply on both sides of the road. Not only can someone park their car in the bus stops after 7:30pm, two hours before the last bus, but they can also park here all day on Sunday and on public holidays, blocking buses. This could make it near impossible for someone with mobility difficulties to board or alight the bus. Most other stops in the area have been changed to full time bus zones. It’s only this one (one of few that actually gets 24-hour buses during rail replacements) that hasn’t been updated. 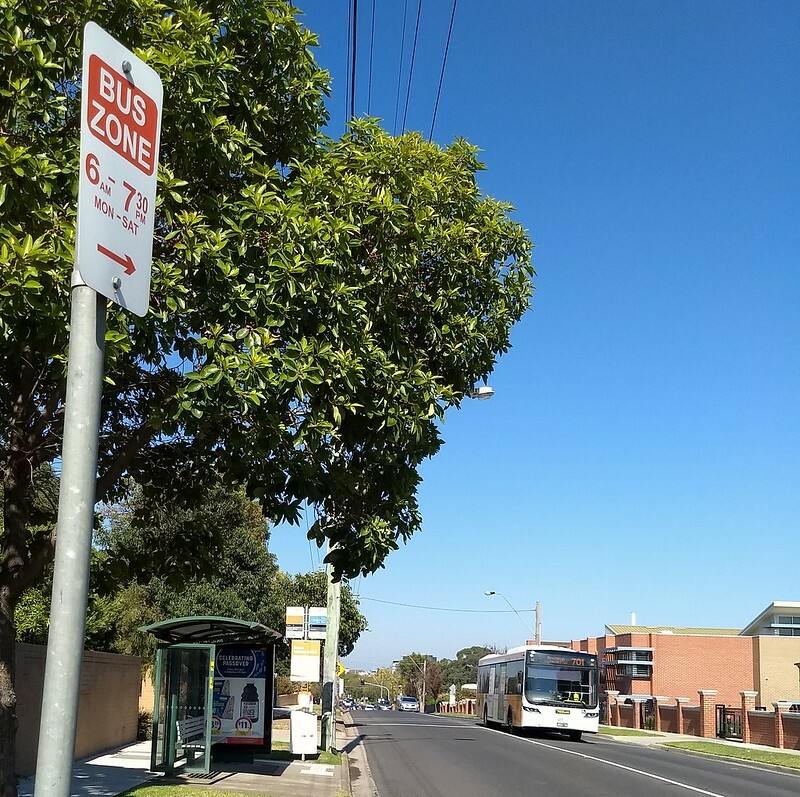 Some local stops have just a bus stop sign – no specific bus zone is marked. This is actually better than having a part time bus zone – regulation 195 prohibits stopping/parking there, regardless of the time (though plenty of people don’t understand this rule). I’m not even sure whose responsibility it is to update the signs to reflect bus timetables. In this case it’s not the council; it’s a Vicroads-managed road. Over the years I’ve raised this multiple times with various people via back channels, but today I’ve tried putting it into Vicroads directly. Will see what happens. But I’m amazed it’s gone unnoticed for more than 12 years. And I’m wondering how many more there are like this?